Gemma’s research interests interests encompass fluvial processes, interactions between hydrogeomorphology and ecology, and integrated river management and rehabilitation. Her research in these areas incorporates the application of Geographic Information Systems (GIS), multivariate statistics, geostatistics and time series analysis to large and complex environmental datasets. Research with Prof. Nick Clifford and Dr Alex Henshaw (University of Nottingham) and Dr Tom Moorhouse (WILDCRU, University of Oxford) explores the effects of invasive signal crayfish on sediment mobilisation and transport and physical habitat. The objectives of the research are to identify the impacts of signal crayfish on the sediment dynamics and physical structure of the river, in order to inform river management and restoration efforts. 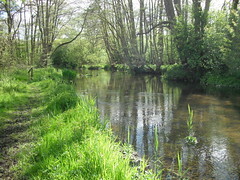 Research with Dr Carl Sayer (UCL), Dr Alex Henshaw (University of Nottingham), and Dr Chris Parker (UWE) explores the influence of large wood reintroductions on habitat complexity and connectivity in the upper River Bure, Norfolk, UK. 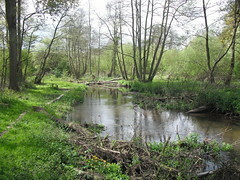 Three contiguous reaches on the River Bure have been selected for field research: a reach where wood reintroduction was undertaken in Autumn 2008; a reach where wood reintroductions will take place in Autumn 2010; and an upstream reach within which no reintroductions are planned. Field research comprises long term monitoring of river stage using a series of pressure transducers; time-integrated suspended sediment sampling; experimental assessment of turbidity response to artificially-induced sediment plumes; seasonal mapping of aquatic vegetation types; and repeat surveys of bed topography, bed sediments, surficial fine sediment depth, and flow velocities. Ongoing research with Prof. Nick Clifford (University of Nottingham) and Prof. Angela Gurnell at the River Cole explores the relationships between flow patches, morphology and physical biotopes at different flow stages within a restored reach. Current research includes exploration of the development of coherent physical habitat patches within a restored river channel and spatio-temporal characterisation of physical habitat patches at the reach scale. The work incorporates field measurement, numerical modelling, and geo-statistical and multivariate analyses. Clifford, N. J., Harvey, G. L., Gurnell, A. M., Harmar, O. P. and Soar, P. J. (in press) Numerical modelling of river flow for eco-hydraulic applications: some field experiences with velocity characterisation in field and simulated data. Journal of Hydraulic Engineering. Clifford, N. J., Harvey, G., Gurnell, A. M., Harmar, O. P. and Soar, P. J. (2008) Numerical modelling of river flow for ecohydraulics applications: some experiences with velocity characterization in field and simulated data. Proceedings of the Inaugural International Conference of the Engineering Mechanics Institute, Minneapolis, May 18-21 2008. This project represents an application of the influential UK Foresight Flood and Coastal Defence project in the Taihu Basin, China. The project aims to consider how the risks of flooding may change in the Taihu Basin over the next 50 years and identify the best options for Government and stakeholders for responding to future challenges. This is a large and complex research project involving over twenty UK and Chinese institutions. The project is funded by the Department for Business, Innovation and Skills, Defra, NERC, Foreign and Commonwealth Office and UN DESA in the UK, and by the Ministry of Water Resources and the Taihu Basin Authority in China. The Taihu Basin region represents an important and rapidly growing urban and economic centre which incorporates the commercial and finance centre of Shanghai. While the region represents only 0.4% of the land area of the country, it supports 3% of the population (36.8 million people) and accounts for 13% of the nation’s GDP. The Basin is faced with flood risks arising from a large number of physical ‘drivers’, including pluvial flooding (monsoonal rainfall), fluvial (river) flooding, intraurban flooding (associated with urban drainage systems) and coastal flooding (storm surges). An urgent need for application of the UK Foresight methodology in the Taihu Basin was therefore identified and the China/UK scientific cooperation project was formulated in 2006 to meet this need. Institutions involved in the research include: University of Nottingham, University of Newcastle, Flood Hazard Research Centre (University of Middlesex), Tyndall Centre (University of East Anglia), Centre for Ecology and Hydrology, HR Wallingford and Halcrow Group in the UK; and the China Institute for Water Resources and Hydrpower Research, Ministry for Water Resources, Taihu Basin Authoring, Chinese Academy of Agricultural Science, Chinese Academy of Social Sciences and Beijing Normal University in China. Harvey, G. L., Thorne, C. R., Cheng, X., Evans, E. P., Simm, J., Song, H. and Wang, Y. (2009) Qualitative analysis of future flood risk in the Taihu Basin. Journal of Flood Risk Management 2: 85-100. Harvey, G. L., Moorhouse, T. M., Clifford, N. J., Henshaw, A. J., Johnson, M. F., Macdonald, D. W., Reid, I. and Rice, S. (in press) Evaluating the role of invasive aquatic species as drivers of fine sediment-related river management problems: the case of the signal crayfish (Pacifastacus leniusculus). Progress in Physical Geography. Harvey, G. L. and Clifford, N. J. (2010) Experimental field assessment of suspended sediment pathways for characterising hydraulic habitat. Earth Surface Processes and Landforms 35: 600–610. Clifford, N. J., Harvey, G. L., Gurnell, A. M., Harmar, O. P. and Soar, P. J. (2010) Numerical modelling of river flow for eco-hydraulic applications: some field experiences with velocity characterisation in field and simulated data. Journal of Hydraulic Engineering. Harvey, G. L. and Clifford, N. J. (In press) River channel restoration for ecological improvement. In: Ecological Restoration, Pardue, G. H. and Olvera, T. K (Eds.). Nova Publishers. Harvey, G. L., and Clifford, N. J. (2009) Microscale hydrodynamics and coherent flow structures in rivers: implications for the characterisation of physical habitat. River Research and Applications 25 (2): 160-180. Harvey, G. L. and Wallerstein, N. P. (2009) Exploring the interactions between flood defence maintenance works and river habitats: the use of River Habitat Survey data. Aquatic Conservation: Marine and Freshwater Ecosystems 19: 689-702. Harvey, G. L. and Clifford, N. J. (2008) Distribution of biologically functional habitats within a lowland river. Aquatic Ecosystem Health and Management 11(4): 465-473. Harvey, G. L., Clifford, N. J. and Gurnell, A. M. (2008) Towards an ecologically meaningful classification of the flow biotope for river inventory, rehabilitation, design and appraisal purposes. Journal of Environmental Management 88: 638-650. Harvey, G. L., Gurnell, A. M. and Clifford, N. J. (2008) Characterisation of river reaches: the influence of rock type. Catena 76: 78-88. Mount, N., Harvey, G. L., Aplin, P. and Priestnall, G. (Eds.) (2008) Innovations in GIS 13: Representing, Modeling, and Visualizing the Natural Environment, Taylor and Francis, Florida. Harvey, G. L., Mount, N., Aplin, P. and Priestnall, G., (2008) Representing, Modeling and Visualizing the Natural Environment. In Mount, N., Harvey, G. L., Priestnall, G. and Aplin, P. (Eds. ), Innovations in GIS 13: Representing, Modeling, and Visualizing the Natural Environment, Taylor and Francis, Florida. Clifford, N. J., Harmar, O. P, Harvey, G., Petts, G. E. (2006) Physical habitat, eco-hydraulics and river design: a review and re-evaluation of some popular concepts and methods. Aquatic Conservation: Marine and Freshwater Ecosystems 16 (4): 389-408.